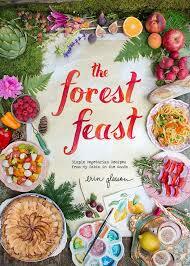 I highly re commend Erin Gleeson’s The Forest Feast, a collection of easy Vegetarian recipes. First of all, I like the background story: Erin Gleeson grew up on an orchard in Sonoma County, CA but moved to New York City as a young adult with an art major, initially drawn to food photography via a volunteering job at the James Beard Foundation. When her soon to be husband accepted a job in Silicon Valley she had to leave her projects behind, and they moved to a cabin in the woods outside of town. She quickly realized that food photography on the East Coast differs vastly from the West Coast – less glossy, more earthier perspectives were needed. As projects were sparse, she started a blog “The Forest Feast” about her own cooking and photos. I appreciate how she successfully accepted the challenge of reinventing herself. Since she is not a trained chef, “just” a person with an interest in good, fresh food, all of the recipes are extremely approachable, even for the novice cook. The ingredient lists are short and widely available, the techniques couldn’t be simpler and best of all – the end result is delicious, even for omnivores. The recipes are written in a nontraditional cookbook format that combines short written instructions with beautiful pictorial descriptions – very fun, colorful and not at all intimidating. Finally, this book has the some of the most beautiful food photography on every single page. The photos portray the colors and textures of the ingredients and the completed dish so realistically that your mind can vividly imagine the flavors. You will want to make some of those dishes right away, which is perfectly ok, because they are quick, easy and very rewarding. There are chapters on appetizers, salads, vegetable dishes as well as cocktails and desserts. Many of the recipes are great for entertaining, and I particularly recommend the asparagus tart, the French radishes (just be sure to use good butter), the butternut caprese salad and the gorgonzola grapes. Honestly, I could make every recipe in this collection, but pick two or three, open a bottle of wine (or make one of her cocktails), have a couple of friends over and enjoy The Forest Feast.